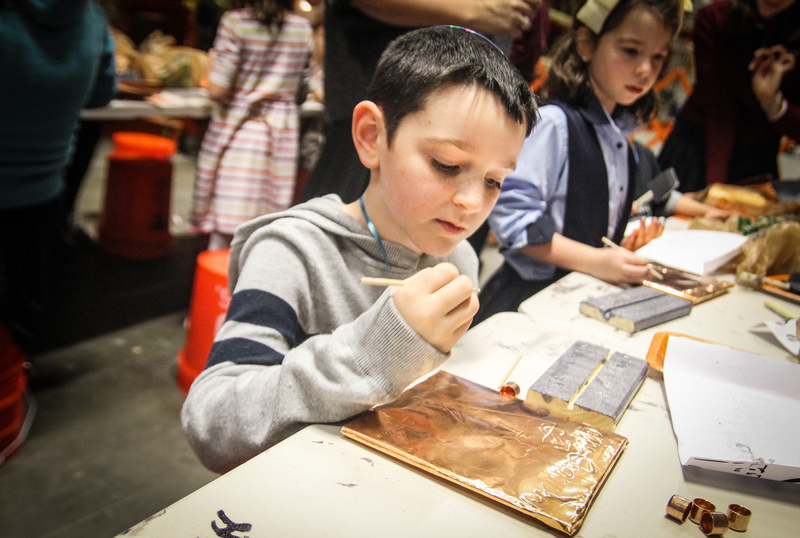 The Friendship Circle of Brooklyn’s Menorah Building workshop at the Home Depot was filled to capacity with over 100 in attendance. The Home Depot on Hamilton Avenue closed off their lumber section to host this event. Beautifully setup, the staff and managers at store #1225 truly outdid themselves! Upon arrival, each child received their very own set of materials and proceeded to take seats on HD work buckets. They then rolled up their sleeves and got to work. The unique Menorah design included painting a wooden base, engraving a copper sheet, and assembling the candleholders. As the children waited for the glue on their Menorahs to dry, everyone enjoyed delicious Chanukah doughnuts. What a treat! This complimentary event offered families a fun and unique opportunity to spend time together, on a cold winter day. The day’s success is due to the hard work and dedication of the FC volunteers, the staff, and crew of Home Depot store #1225 headed by Ms. Liz.